Genius. This book must be a work of genius. I have not yet received my copy from Amazon, but from visiting the site I know this "manual" must be clever. Look at the illustration on the back cover alone. The silhouettes of a 1950's style nuclear family is brilliant to the last detail of the boy with the propeller hat. The full press release can be read by expanding the full article below. 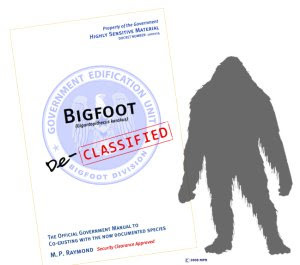 SPENCER, Mass., March 24 /PRNewswire/ -- In the new book "BIGFOOT DECLASSIFIED" by M.P. Raymond, life in America is beginning to change and the author takes us on a unique journey in a world where Bigfoot is real and becoming a part of American culture. Through modern secretive technology and the acquiring of several specimens, BIGFOOT is now a documented species. This is the only approved government text that focuses on understanding and controlling the legendary creature. * Read harrowing stories of Bigfoot encounters throughout the world, and how this avalanche of information has overtaken man. See how it all started and why this government manual is a mandatory read. * Learn new facts connected with the scientific validation of classic Bigfoot stories. * Gain a new understanding about Bigfoot from the many recent studies completed at the secure state-of-the-art Eco-Habitat, a secretive habitat that was created by the government, specifically for Bigfoot. * Learn about the BF Crippler, a powerful tool for teaching and controlling this mighty beast. Take a ride in the BF Juggernaut, a high-tech military transportation vehicle designed to obtain and transport the legendary creature. * Read fascinating interviews with key people in the edification process. * Find out what the government expects - and demands - of you in this pursuit for security and harmony between man and beast. For further information about this manual, please contact M.P. Raymond, 508-713-2257, mpraymond5@yahoo.com, or visit http://www.bigfootdeclassified.com/ or http://www.iuniverse.com.